If you have a hard time munching on apples and oranges, you can fulfill your daily recommended intake of fruits and vegetables by drinking 100 percent juice, advises the U.S. Department of Agriculture. If you juice your own fruits and vegetables, follow safety guidelines to help prevent foodborne illness. One important health protocol is to consume fresh juice immediately after it is squeezed. To avoid contamination, drink freshly squeezed juice as soon as it is prepared. Prepare only as much juice as you plan to immediately consume -- do not prepare a extra juice with the intent of storing it in the refrigerator for later. According to the U.S. Food and Drug Administration, freshly squeezed juice can quickly develop potentially harmful bacteria unless it has been treated. Most store-bought juices have been treated through the process of pasteurization to destroy bacteria. Because the freshly squeezed juice you prepare at home is not pasteurized, it may grow potentially dangerous bacteria if you don't drink it right away. Drink juice you make at home immediately. Avoid raw juices at markets or restaurants if they've been sitting on a counter or buffet table. If you drink contaminated juice, you may experience symptoms such as vomiting, diarrhea and stomachache. In addition, you may develop fever, headache and general body aches. Symptoms of foodborne illness may present themselves as early as 20 minutes or as late as six weeks after drinking contaminated juice. If you experience any of these symptoms, seek medical treatment. You can avoid the temptation of saving leftover juice by working to ensure you only prepare as much juice as you will drink right away. Keep in mind that one medium orange will yield about 1/4 cup of orange juice; one medium grapefruit will yield approximately 2/3 cup of grapefruit juice; 1 pound of carrots will yield about 1 cup of carrot juice. If you find yourself with too much juice and you just can't find it in you to throw it away, put the excess in ice cube trays and save it for later. The juice cubes can be added to water for a quick spritzer. 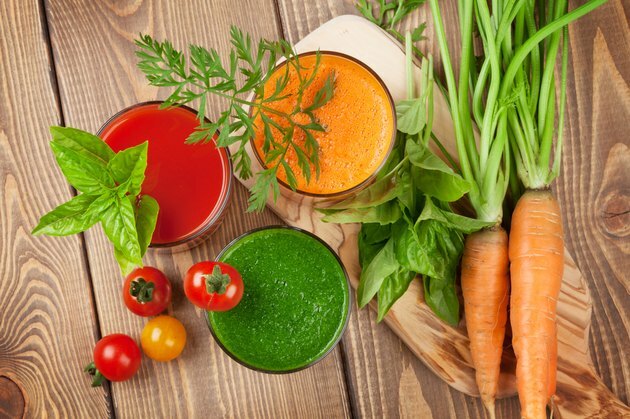 The majority of juices sold in supermarkets have been pasteurized to eliminate bacteria. All prepackaged juices sold in supermarkets are required by the FDA to carry a warning label if they were not pasteurized. However, keep in mind that the FDA does not require warning labels on freshly squeezed juices that are sold in individual servings. This means that a glass of freshly squeezed orange juice bought at a farmer’s market or a glass of fresh apple cider purchased at an apple orchard may not have been pasteurized and may not indicate that it has not been pasteurized. ChooseMyPlate.gov: Fruits: What Foods Are in the Fruit Group? ChooseMyPlate.gov: Vegetables: What Foods Are in the Vegetable Group? CDKitchen: Oranges: How Much Juice? CDKitchen: Grapefruit: How Much Juice?